Gosho has been at Takarakuza College today (April 15th, 2018) and there was a Q&A. I'll post and translate all Q&A I can find. Q1) "Why did you change the manga style to the current one, compared to how it was on the beginnings?" A1) "I wasn't conscious of that (laughs) I drew things like that!?" Q2) "What about Ran-chan's head?" A2) "Everyone points that out to me (laughs). It happened to turn into that (laughs). I wanted a symbol-like thing, to be able to tell who it was from the silhouette. Like how I thought that my dad was wearing a hat the whole time (laughs)"
Q3) "Shinichi and Ran have begun to date, but will there be a boyfriend-girlfriend-like interaction in the future?" A3) "There'll be (laughs) Maybe they'll become a couple by next year's movie? Oh? (laughs)"
Q4) "How's the chronology between the movies and the manga organized like? Is the "Crimson School Trip" after "The Crimson Love Letter"?" A4) "I was troubled by that, actually. I did consult with the editor if I should depict it as Momiji firstly meeting Sonoko... Well, it came out well enough, no? (laughs) I don't think much about the chronology with the movies"
Q5) "What's the tone of coloring you use for Amuro-san's and Heiji's skin color?" A5) "The same! Number 51! (laughs) Everyone else uses Number 61, but I use Number 51 because it has a bigger grain! It doesn't get crushed, hence why Number 51 is the best!" Q6) "Shinichi said he wanted to become the Heisei (Note 1) Sherlock Holmes, but will Conan end during the Heisei Period?" A6) "No, if the period name changes then I'll nonchalantly change it to the new period's Holmes (laughs) I should also nonchalantly insert a line about that (laughs)"
Q7) "Did you intend to make Amuro Tooru appear when you made Akai Shuuichi debut?" A7) "Well, I did have the idea in a corner of my head! I did think of making a rival character or worthy opponent! I actually thought of naming him "Shiroi" (laughs). But I thought it might be a bit odd so I went for Amuro (laughs)"
Q8) "Amuro-san asked Azusa-san about her plans for Christmas before the break, though?" 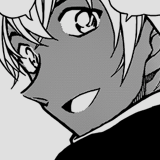 A8) "Amuro was saying "Not really", Azusa might've said (laughs) then you could switch work shifts with me? (laughs)"
Q9) There was a scene featuring them in "Zero the Enforcer," though?" A9) I did draw that scene! Q10) "A normal Conan cases is 3 chapters, but do you decide the length beforehand?" Q11) "Why is Amuro-san so popular?" A11) "Well... I dunno (laughs). Why, I wonder (laughs). Maybe the fact that he can't beat Akai makes him popular (laughs) That might be it (laughs)." Q12) "The last question in "Zero the Enforcer" was a great!" A12) "Glad to know (laughs) I told them to add that one (laughs)!" Q13) "What were the good things of becoming a mangaka?" A13) "You earn a lot of money (laughs) You can eat juicy stuff (laughs). But you get less sleeping time... But now I sleep a lot! (laughs)"
Q14) "If Conan goes back to being Shinichi, how will he relate to those around him?" A14) "I can't tell you that (laughs) I almost made a slip (laughs)"
Q15) "Are you planning on drawing that?" A15) "Well, let's see... I do (laughs)"
Q16) "How do you decide the codenames of the BO members?" A16) "Gin was an idea by an assistant, he said he looked Gin... I was like "really?" (laughs). As for Vermouth, I was told to use Vermouth (laughs) I get directed a lot by my assistants, although not that much (laughs)"
Q17) "Why did you make Hattori Heiji dark-skinned?" A17) "I wanted to make him the complete inverse of Shinichi (laughs)! I thought that'd be a dark-skinned character, then (laughs). But my assistants disliked the idea. They said it was annoying to draw! (laughs)"
Q18) "I think the best part about your work, Sensei, is that you don't kill the criminals and have them live to atone for their sins but why did you make the culprit of Moonlight Sonata die?" A18) "I thought that an occasional exception would do fine (laughs) It was a necessary victim so that Conan could tell Hattori that he's not perfect and that he actually "killed" someone (laughs)"
Q19) "All the movies always have some scenes drawn by you, Sensei, but do you decide which ones you want to draw?" A19) "Yes! I put a circle in the storyboard that Director Tachikawa gave me to indicate I'd draw those! (laughs) I generally draw the scenes which have lines that I thought of (laughs)!" Q20) "What's the origin of Conan's "there's only one truth" amongst the famous lines of the manga?" A20) "It was actually a coincidence, in the chapter of Heiji's debut Shinichi said "because there's only one truth", and at about the same time the anime came up with "there's always one truth", so it really was a coincidence (laughs)." Q21) "What works did you use as reference when making up the character of Amuro Tooru?" A21) "I often say that Akai looks like Char, but Amuro is Amuro (laughs). Amuro's an original character (laughs)"
Q22) "What are the characters that are easier to draw and harder to draw within your works?" 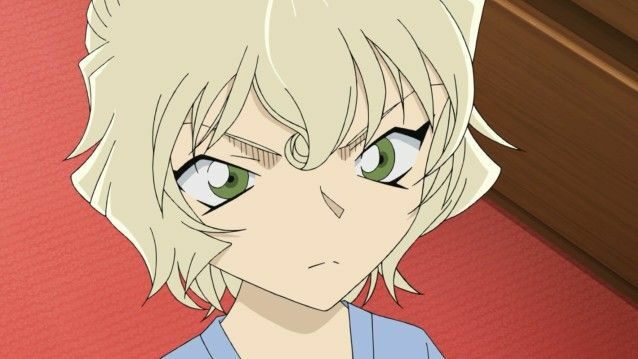 A22) "Kaitou Kid is hard to draw, yes... And Amuro is easy to draw (laughs). Akai is hard, but Amuro has a special feeling to him (laughs)"
Q23) "What are the origins of Kaitou Kid?" A23) "At first he was unpopular with the chief editor (laughs). Saying he wasn't fashionable at all (laughs). There was "Cats Eye" (see note) as high school thiefs at the time. the youngest sister was a high school student. Yet there wasn't a guy thief so I thought I could come up with one of my own (laughs). I was faster so I won (laughs)." Note: "Cat's Eye", manga about a group of 3 sisters who steal works from a fictional European artist. Q24) "Why did you think of making the heroine strong instead of weak?" Q25) "What scenes were fun to draw and which were hard to draw?" A25) "A fun one was that final two-page spread of the Kiyomizu Temple (laughs). The background was drawn by a Takarazuka college alumni, and they spent about 1 day to draw it up. (laughs) I only drew Shinichi and Ran (laughs). That scene was fun. The Bell Tree Express scenes were hard to draw (laughs)"
Q26) "Why is it that the characters' clothing is so fashionable?" A26) "I used to buy a lot of clothes at Anan or Non-no or CanCam (laughs). Amuro often appears in the latest cases so they asked me to think up Amuro's clothing (laughs). I have them think of making files about the clothes in every case." Q27) "Are there plans for a movie focused on Shinichi and Ran?" A27) "I wonder about that (laughs) I dunno but I can't say too much into this (laughs) oh well, look forward to it (laughs)"
Especially Q18 is one of the things that separate DC from other series. I've seen many detective fiction fans talk about that moment, as well as Kaito's first appearance. Spimer wrote: Gosho has been at Takarakuza College today (April 15th, 2018) and there was a Q&A. I'll post and translate all Q&A I can find. there are three more questions. One about strong-vs-weak female characters, one about Kiyomizu temple and one about clothes/fashion. Added to the list, thank you for the tip.